Sanitation microfinance has the potential to sustainably improve access to sanitation. Previous studies have shown significant increases in latrine purchases and willingness to pay, when households had access to appropriate microfinance products. The microfinance sector in Cambodia is very well developed, with about eight large and over 30 smaller MFIs serving over 1.5 million borrowers – around 10% of the population. Their wide geographical distribution network offers significant scope to couple microfinance products with sanitation marketing efforts in order to increase uptake of improved sanitation. In 2014, EMC was contracted to study sanitation microfinance models in rural Cambodia. 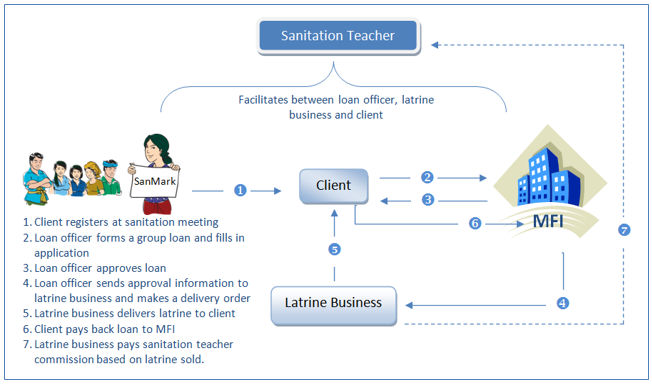 In particular to evaluate how MFIs support access to sanitation, assess different MFI sanitation models, and recommend best practices for scaling up MFI sanitation financing. Specifically two prominent models were examined; Sanitation Financing (SanFin) implemented by PATH / iDE and WASH Loans implemented by WaterSHED. The microfinance component contributes to scalability, by expanding the addressable market to a segment of consumers who lack the savings to pay 100% immediately. However, to achieve profitable, and therefore sustainable operations, the programme needs to develop an efficient model. One that allows MFIs to reduce their cost of sales to level consistent with small loan size. The two examined programmes have significant elements in common. They both aim to closely integrate the financing mechanism with their existing sanitation marketing approaches, recognising the need for supply chain development as well as demand creation activities such as sanitation education and behavioral change communication (BCC). An online copy of the report can be found here. EMC has also undertaken similar work in other sectors, such as Solar Home Systems. EMC was hired by Plan International, under the CR-SHIP program, supported by Global Sanitation Fund and Ministry of Rural Development. Subsequently we also studied the impact of sanitation subsidies on the WASH sector, in order to support development of guidelines on their use.